Designed to deliver picture quality accurate to the filmmaker’s original intentions. The DX802 uses Panasonic’s cutting edge Studio Master HCX processors with professional-quality colour management technology, achieving a wide colour range to capture every nuance and detail of the original film. Art and Interior. Taking inspiration from the world of interior design the DX802 has been artfully created with a blend of elegance, premium materials and subtly sophisticated sculpting to ensure that they both harmonise with and enhance the look of any room they find themselves in. The Studio Master HCX* 4K processor represents the pinnacle of Panasonic image processing. Tuned by Panasonic Hollywood Laboratory this delivers images true to the filmmaker’s vision. A display that has been THX Certified. 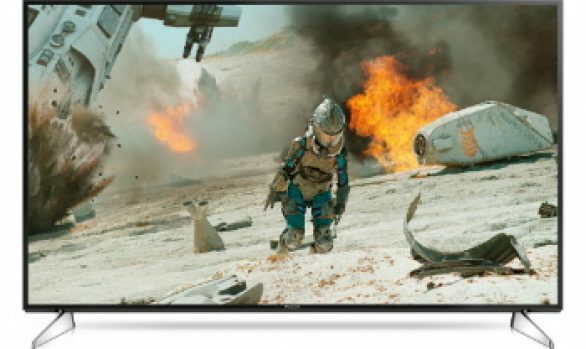 Only Televisions that pass 400 THX lab tests within 30 categories receive THX 4K Display certification. Panasonic have really impressed us with this Television. It looks fantastic and the separate speaker really makes a difference. THX Certified for its picture quality and we agree the colours acheived are very realistic. The A Frame design is something so different to what we have seen before, and beleive us when we say we have seen alot tried in the sixty years we have been here. It gives it a very modern look and on the right stand becomes a piece of art. As you would expect from Panasonic, the image quality is superb and the TV has a range of picture modes including presets from THX. The speakers on all flat screen TV’s are never the best because of their physical size, but this separate speaker really makes a huge difference without making the sort of noise levels that would get the neighbours knocking on the door. The speaker can be wall mounted if you decide you would like us to put the TV on the wall. (Yes the TV does come off the stand if you want it wall mounted). Both Freeview HD and Freesat HD Tuners built in to this Television which is such a handy feature if you require satellite signal but dont want that separate Freesat Receiver. A stunning Television both in looks and performance, you wouldn’t be disappointed.